Red Velvet Truffles are a must make Valentine’s Day treat. So easy and oh so yummy!!! You will fall head over heels for these and if you want someone to fall in love with you, make them these sweet little bites. I’m not kidding. 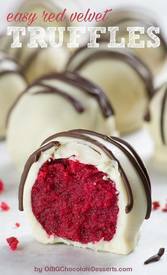 Red Velvet Truffles are bites of red velvet cake rolled up and dipped in white chocolate. And when it’s about red velvet cake, what goes perfectly with red velvet, besides white chocolate, cream cheese frosting may be the answer you’re looking for. Since I don’t like too sweet desert I decided to use just softened cream cheese instead frosting this time.